Tabula Rasa: Happy Women's Day! Honestly, I don't love my teachers, friends, my mother, sisters 'because' they are women. They just happen to be women! If I had a brother, I'd love him just as much!! So, there's no question of specially reserving 'Women's Day' to tell them how much I like/need/owe them! But, I thought about it and there are a bunch of people(who also co-incidentally happen to be women!) that I really admire and would like to thank! So, I'll use this day and this space for that! 1. Enid Blyton: For giving me the most imaginative childhood a kid can dream of! She's the reason I started loving books. Call me silly, but I wouldn't get tired of reading 'A Book of Brownies' or a 'Five Find-outers' mystery even today. In fact, I'm pretty sure there's a 'Yellow Story Book' lying on my desk as we speak. I still haven't come across an author who can describe food the way she could, really! Our love for Enid Blyton's books was one of the reasons me and my best friend became, well, best friends!! 2. J K Rowling: For giving me some of the best times of my life!!! Harry Potter is more than just a book, it is like an alternate reality. The only reason Rowling is 'second' is because I was older when I read Harry Potter! I don't think I'll ever love a book more. There aren't enough words in the English language to describe how much I love the series. I have written here the best I could! 3. 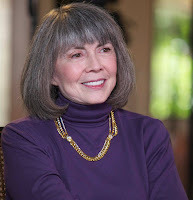 Anne Rice: For giving me something interesting to read on Facebook every day. She is most famous for her 'The Vampire Chronicles' series and her books on Christianity. But it's not her books that I love her the most for. I joined her fan page on Facebook ages ago, and I have been reading her updates every day ever since. She writes about politics, religion, books, writing. It's not only that I like that she interacts with all her fans; I've just fallen in love with her writing! 4. Keri Smith: For bringing back the lost artist in me. Keri is an illustrator, author, guerrilla artist and a blogger! This, here, is her site! Be sure to check it out. There's no other word for a person who has 'written' books titled 'Wreck this Journal' or 'Tear Up this Book' than: crazy(albeit in an awesome way!!) Plus, she was the reason I did this!! 5. Marta Kauffman: For co-creating and co-writing only the best sitcom in the history of time. For those of you who couldn't guess which, in spite of the very accurate description; that'd be FRIENDS. Now that we have established that the only things I do, or that matter to me, are books, television and doodling around, let me get back to the less interesting, more necessary things like studying, for instance. 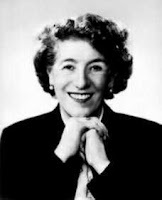 Seriously, I never knew Enid blyton was a lady! I would add Agatha Christie to the list. Somehow, I never got around to reading much of Agatha Christie, and when I did start reading I was already over my 'mysteries mania'!! I do regret that though, I liked Poirot! !